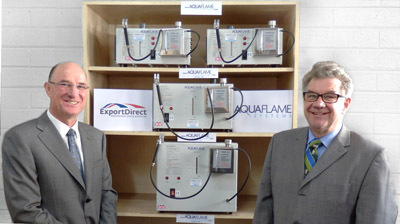 Peter Wright, Director of Aquaflame Systems Limited has appointed ExportDirect to set up a worldwide network of distributors for their range of oxyhydrogen precision soldering equipment. The Aquaflame machines produce a clean high temperature flame for soldering rings, earring posts, and all types of chains. Their versatility enables the operator to do small melt ups and anneal precious metal alloys. The larger machines will also solder platinum jewellery items. ExportDirect is run by two familiar faces that are both well known in the jewellery industry. They are Huw Davis and Chris Hewitt who between them have over 60 years’ experience in supplying manufacturing equipment and consumables to the world’s major jewellery manufacturing centres. “In a sense we bridge the gap in getting companies started in exporting and then help them in establishing their own in-house export department” said Huw Davis “Aquaflame is an ideal client for us. The product is well established in the UK and Dutch markets and Aquaflame Systems Limited has developed an advanced manufacturing process to ensure that the machinery is of the highest quality. The machines are reliable, robust and are manufactured entirely within the UK.